There is an old Chinese curse that goes something like, "may you live in interesting times" (source). This blog is predicated upon the notion that we have indeed been afflicted by this ancient proverb. Few issues bring forth the preponderance of surreal ideological juxtaposition than the 9/11/2001 terror attack in New York City does. Take just one example among many: Christian Evangelical Pastor Terry Jones and his forthcoming "Burn a Koran Day," being held on the ninth anniversary of the 9/11 WTC attacks (source). 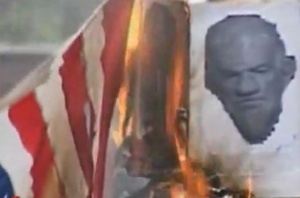 Online and in person, I have defended this pastor's right to burning the Islamic holy book, as it is protected speech. Indeed, as core "political speech," courts have held that such a demonstration deserves the highest protection. While the burn permit for this protest has been refused by the city of Gainesville, I would also argue that, so long as the Qurans and the site are lawfully owned, the property owner has a right to burn these books regardless of local bureaucratic opposition. Of course, I might also argue that the burning of any book, a favorite activity of churches over the centuries (source), is almost inherently counter-productive and flatly anti-intellectual. But that is just reason #1680 as to why I am an anti-theist. I am willing to criticize book-burning in general but nonetheless defend the right of any individual or group to burn any book. The debate on issues like this quickly leave the legal orbit of what is Constitutional and float around aimlessly into what is "moral" - which of course is up for rhetorical grabs. To be sure, this makes for a much more interesting (albeit less defined) debate, inviting many subtle positions on the issue. Concepts such as religious tolerance, hate speech, Sharia Law, Biblical truth, the oft-repeated conservative "Christian Nation" mantra, and ecumenical values of effete liberals are tossed about. In the end, it is unlikely that anyone's mind is really going to be changed as a result. While the television camera can capture light more easily than heat, issues like this seem to generate the exact opposite. In Afghanistan: protest ignited by a proposed protest. Pastor Jones now carries a .40-caliber pistol for his own safety, having been advised by the FBI that such a demonstration will generate foreseeable danger for the Pastor's personal safety. He claims to have received over 100 death threats already, and I have no reason to doubt this. What if only 1% of these 100 people make good on this threat? There is little surprise that Pastor Jones is working from his deep conviction in his own imaginary God rather than rational self-preservation. When your chief role model is a martyred man, born of a virgin and who rose from the dead, any delusional action is possible. Free speech is a sacred concept in the project for civilization, and one that is poorly-understood in many circles of the world. The notion that "you don't have a right not to be offended" is, despite the frank parlance, a complex idea. Respecting the right to expression of those one disagrees with can be downright difficult, yet defending their freedom to express such views is paramount - even and especially around a controversial subject matter such as religion. Pastor Jones' actions may be ill-advised but I will nonetheless defend his right to burn Harry Potter books, the Quran, or the flag of his choice. So long as this is his property, it is none of our business what he does with it. 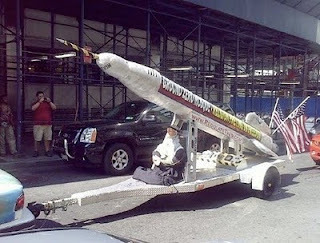 A decommissioned missile that "Ground Zero Mosque"
Which is why, for the exact same reason, I believe the Park51 Project (woefully mis-characterized as the "Ground Zero Mosque") should be defended by all liberty-loving people of the world. This Islamic community center, which includes a 9/11 memorial and is two blocks away from the World Trade Center site, is private property which has been legally obtained by the Cordoba Initiative at an abandoned Burlington Coat Factory building (source). And forget what Fox News is ginning up about "terrorist money" being used to fund this site; this is inflammatory nonsense and further none of our business because private organizations have no obligation to disclose their financial records to city governments. That one would object to the demonstration against the Quran or the construction of the Islamic community center is the central problem. It would seem that, all too often, people are inclined to support free speech they support and rally against the expression of ideas they disagree with. Perhaps it is the visceral reaction to an opposing point of view, perhaps it is the insecurity one might feel about their own views that they would wish to prevent competition in the marketplace of ideas. Simply put: the most civilized act any American can do is respect the private property rights of the Cordoba Initiative in lower Manhattan; the most thoughtful response any Muslim can have to Pastor Terry Jones is respect his right to freedom of expression. 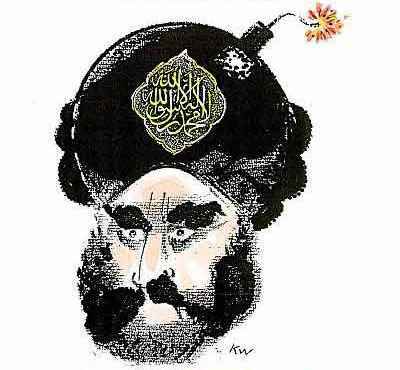 proved this cartoon's point by blowing things up! So why is this much easier said than done? Two words: religious dogmatism. Islam clearly has a deep cultural problem in the West; many Muslims wish to enjoy the liberty of a pluralistic society but often cannot tolerate criticism of their own faith. 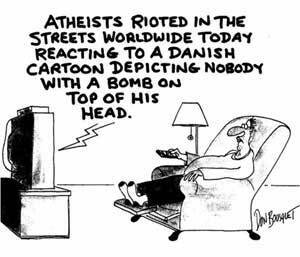 The 2005 Danish cartoon controversy illustrates this problem more dramatically than any other (source). While many Islamic leaders regularly criticize Western culture (including dress, music, secular government, and the liberty of women generally), criticism of Islam itself sets off a powder keg of violence - (not so) ironically best illustrated by the cartoon in question. While the publication of this cartoon in Jyllands-Posten did harm to no one (except for violating that imaginary "right not to be offended"), offended Muslims were responsible for the death of over 100 across the Middle East and massive destruction of embassies, businesses, and other forms of "Western Imperialism." 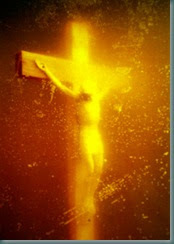 Sure, Christians were upset when Andres Serrano dunked a crucifix in urine (source)... but at least no one died. The fountainhead of this animosity, against Muslims and Christians alike, is rooted in the divisive nature of religious fundamentalism itself. And by that, I really mean religion itself, because "religious moderation" effectively amounts to diluting the acidic bath of dogmatism with some neutralizing secular values and reasoned discourse. These Holy Books are themselves fundamentally at odds and with irreconcilable differences to one another. Pastor Terry Jones understands this better than most; he is convinced "Islam is of the Devil" (source). Surely nothing less would compel him to risk his life in demonstrating this. Similarly, Sayyid Qutb, cited by many as the intellectual father of radical Islamic Jihad and its modern outgrowth in the form of Al Qaeda, drew his disdain for Western culture from his own faith (source). Anyone watching this clash of ideologies unfolding from Mars would rightly conclude that mixing 1st Century beliefs with 21st Century weaponry is a recipe for the end of human life on Earth. "Those who wish that there would be no mosques in America have already lost the argument: Globalization, no less than the promise of American liberty, mandates that the United States will have a Muslim population of some size. The only question, then, is what kind, or rather kinds, of Islam it will follow. There's an excellent chance of a healthy pluralist outcome, but it's very unlikely that this can happen unless, as with their predecessors on these shores, Muslims are compelled to abandon certain presumptions that are exclusive to themselves. The taming and domestication of religion is one of the unceasing chores of civilization. Those who pretend that we can skip this stage in the present case are deluding themselves and asking for trouble not just in the future but in the immediate present." 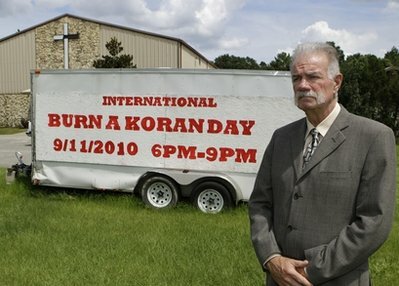 It should be instructive that the most vocal and violent opposition (source) to the Islamic cultural center in Lower Manhattan are from Christians and that Christian Pastor Terry Jones is organizing "Burn a Koran Day." It should also be of little surprise that no single act prompts more violence by Muslims than a demonstration against Islam. So long as anyone is admonished to uncritically support religious faith - being such engines of division and brutality, and so long as criticism of faith (Islam, Christianity, or any other stripe of irrational dogmatism) prompts death threats and intimidation, freedom and liberty are threatened for everyone. While "militant atheism" is a popular term of derision for Hitchens and other outspoken secularists like him, the genuine militant barbarism - directed against mind and body - is that of theism. So let us all draw Mohammed (source), let us all be De-Baptized (source), and let us all remember that we share a single, fragile planet and needn't delude ourselves with religious fantasies any longer.